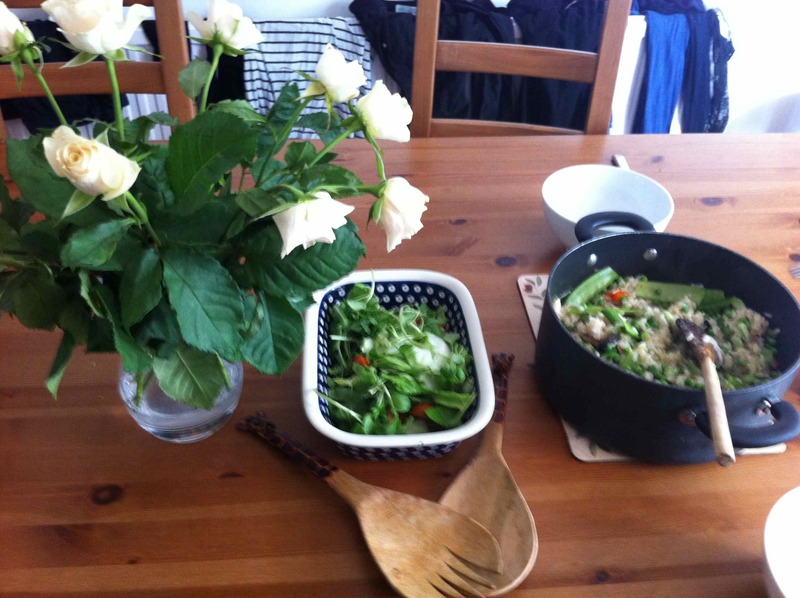 Tonight I cooked spring vegetable risotto with bacon. I dry fried the chopped bacon, added garlic and spring onions, chestnut mushrooms, and a half of a red pepper (which was looking lonely in the fridge). After frying for a few mins I added a little olive oil and then the risotto making sure the risotto got nicely coated, then a dash of white wine and a pint or so of chicken stock – and left to simmer. Meanwhile I got frozen broad beans and peas, and chopped asparagus tips and mange tout ready to lightly cook before adding to the risotto mix. Lovely with grated parmesan cheese and a green salad! One thing I learnt when I first went to Italy years ago was that what we called Spaghetti Bolognese is really not the way the Italians would do it! There are two secretes to good pasta and sauces – the first is the use of fresh pasta and the second is that the sauces should have very little to them – simple is best. So today I made a garlic and chilli sauce. I add a good glug of virgin oil to the pan; about 4 cloves of garlic and a chopped red chilli and let the mix cook for a while. At the end I added the juice of a lemon. 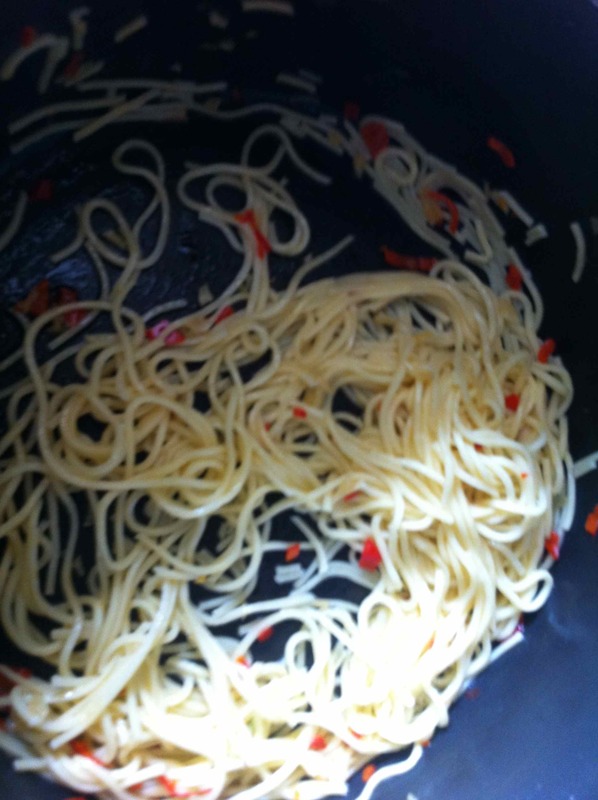 Simply pour over the pasta when it’s cooked! Tonight I cooked Chinese tofu stir-fry. Cut the tofu into small cubes and fry in olive oil until golden. This is a little fiddly but worth the effort. 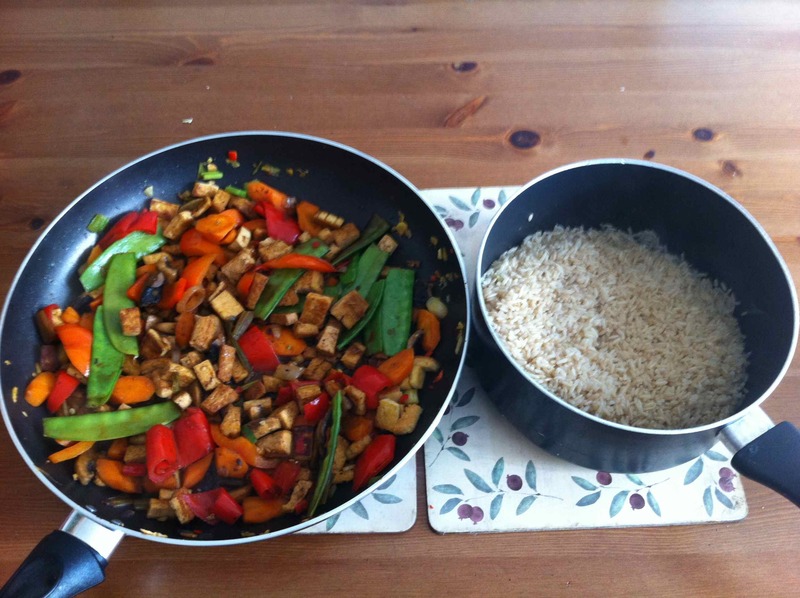 Once that is done remove the tofu and add garlic, red chilli, ginger, sliced carrots, spring onions, chestnut mushrooms, mange tout and red peppers to the pan. Then add some Chinese five spices. Once cooked add a splash or two of dry sherry, some soya sauce and a little ketchup. Serve with nutty brown rice! 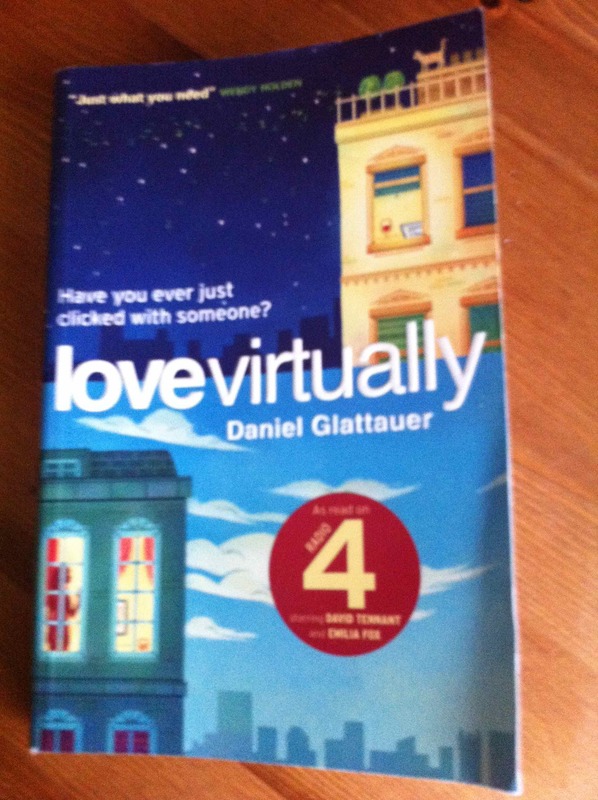 A favourite with my elder daughter! 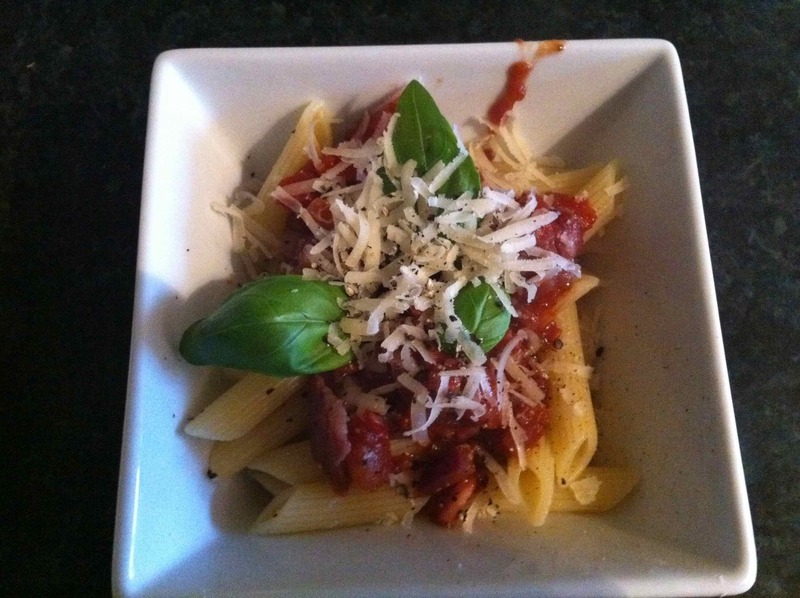 Tonight I made a Jamie Oliver pasta dish. Fry chopped garlic, chill and the chopped salami in olive oil. Add the chopped fennel and some crushed fennel seeds. Add some passata and a little red wine and season to taste. You can add a little extra chilli flakes if you like things hot. Cook for about half an hour. Fry some breadcrumbs in olive oil and sprinkle over the top. This adds a nice crunchy texture to the dish. Serve with fresh spaghetti and a crisp green salad. Tonight I cooked chicken with fennel from a recipe from one of my new South African books. Marinade the chicken breast in olive oil, salt and pepper. Roast red and orange peppers covered in olive oil and sunflower oil in the oven till slightly blackened. Cook sliced fennel and lots of garlic (!) in water till the water evaporates, then add olive oil and cook till soft. Arrange the fennel and garlic around the chicken. Cover the chicken with soya sauce, lemon juice and clear honey and bake in the oven at 180 for about twenty minutes. Then pop it under the grill for ten minutes, basting the chicken with the juices first and finally garnish with the peppers. 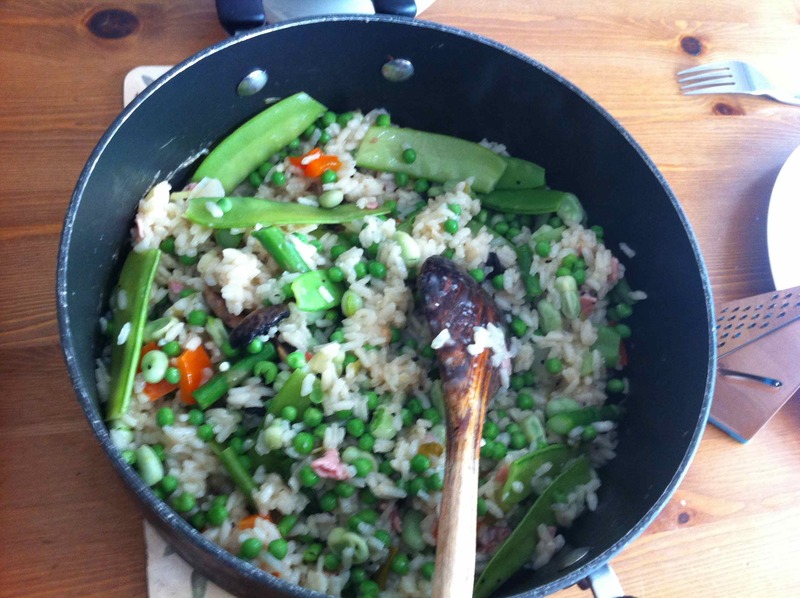 I served it with egg fried rice – jasmine rice, peas, spring onions, chilli, ginger and a little brown sugar – fry together and then add flaked omelette. I have just got back from a great trip to South Africa, my first time there! I was there with five of my colleagues from Leicester. We did twelve presentations and workshops at UNISA – South Africa’s major distance educational provider – they have around 350, 000 students! We didn’t have much time to explore, but we did manage to get to a lovely market on the Sunday, called Rosebank. I was impressed by how clean and modern everything was and the people were really lovely. I bought a number of things including some South African music (Vusi Mahlascla – Naledi Ya Tsela and Miriam Makeba – The unforgettable) – great, great music! I also got some cute salad serving spoons with giraffes on 😉 and two cookery books. 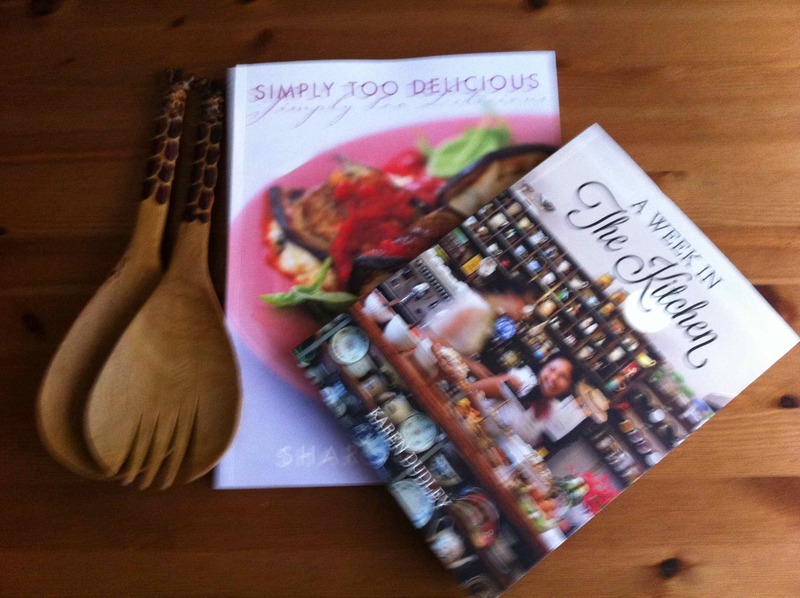 Looking forward to trying out the recipes. Paul our host also gave me a tin of the famous Chakalaka – it’s a kind of mild vegetable curry – delicious! So overall a good trip both personally and professionally. Hope next time I get more of a chance to see the country! Whenever I return from my travels and days of exotic eating, all I crave is simple home cooked food. I have just returned from South Africa and so tonight I am cooking a simple tomato-based sauce for pasta. Fry an onion, garlic and a red chilli, along with some chopped bacon. Add a tin of chopped tomatoes and some red wine. Season, add mixed herbs, fresh basil, a little tomato sauce (it’s good honest! ), tobasco and Worchester sauce to give it a bit of a bite. Then simply leave to cook slowly. 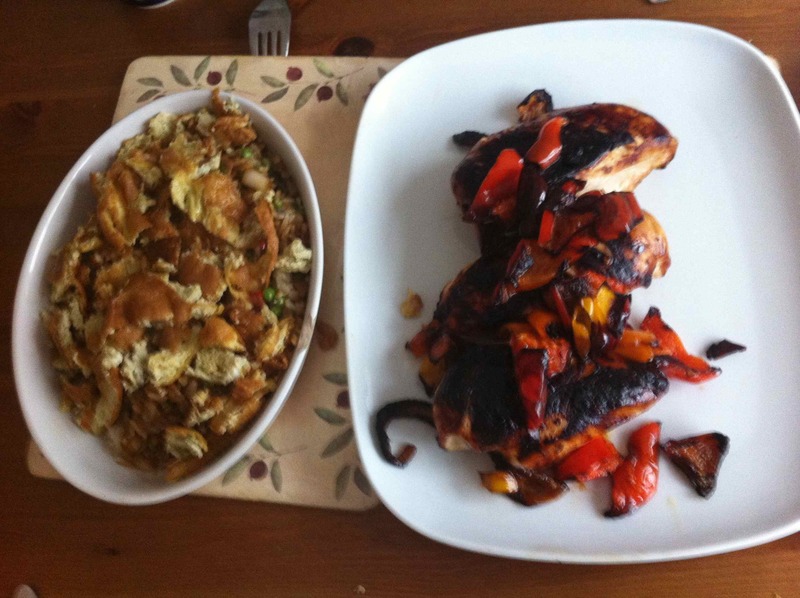 Delicious….. I had friends come to stay from Australia on Thursday. 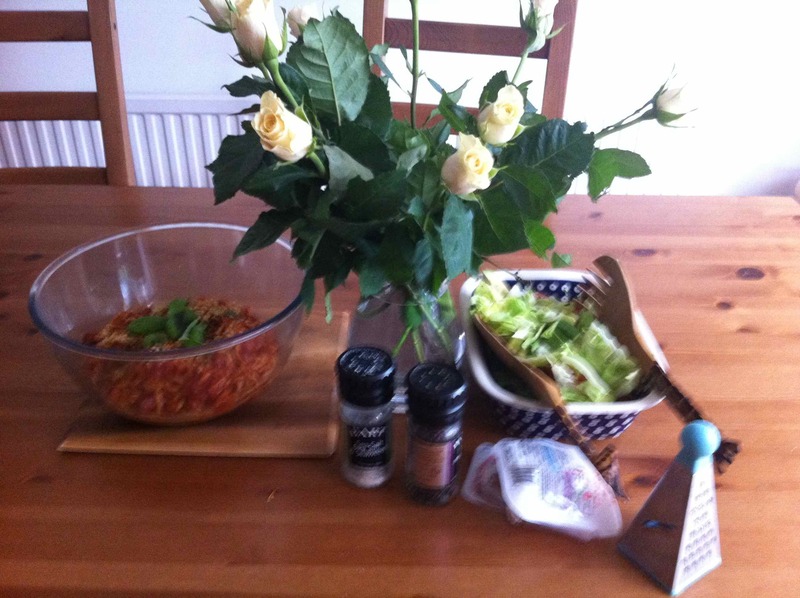 I made Lamb Tagine for main, which I have blogged about before. 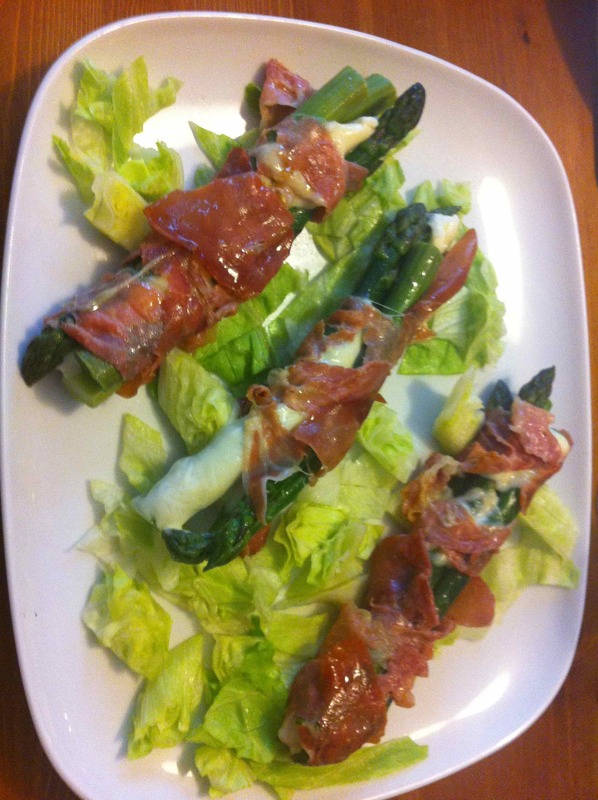 For a starter I did asparagus with mozzarella and prosciutto. Blanch the asparagus for two minutes, then take four per person. Lay two side by side, put sliced mozzarella on top and then top with two more asparagus tips, then wrap with the prosciutto. A bit fiddly but worth it. Then simply fry in olive oil till the mozzarella starts to ooze and the prosciutto has changed colour. Delicious! For lunch yesterday I made tomato and pepper soup. 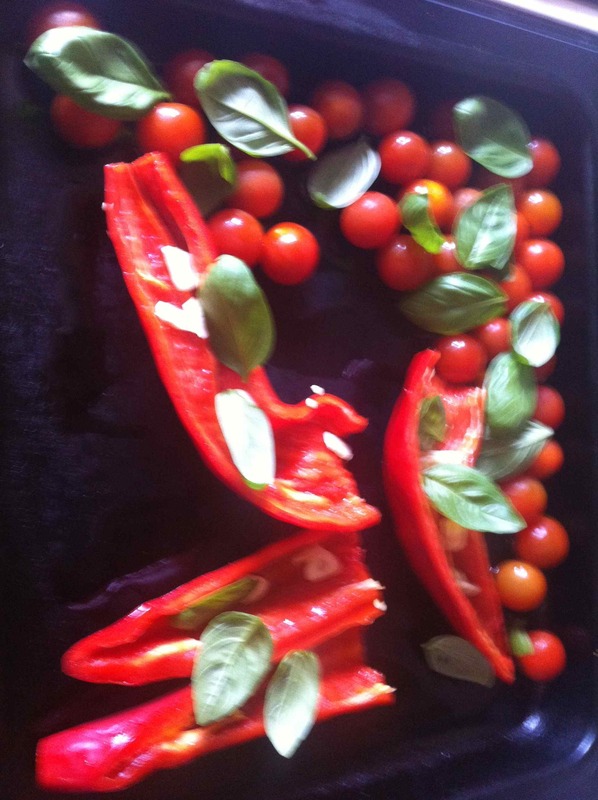 Roast the tomatoes and sliced peppers in the oven along with olive oil, seasoning and fresh basil, until they are slightly burnt. Fry onions and garlic. Add a couple of pints of chicken or vegetable stock and then some potatoes (to thicken it). Add the tomatoes and peppers. Use a little of the stock to get all the good bits from the roasting pan. Season and boil and then puree – really delicious! We followed this with lots of nice cheeses, ham and salad. A lovely, simple lunch.